The show, I recall, was performed at a dicey-neighborhood venue called the Axiom, which seemed ready to crumble around us. And the audience, at least in my memory, was dressed mostly in black, with no shortage of piercings and tattoos. This is Houston? I wondered. Once the show was up and running, the phrase changed to: Now THIS is Houston! 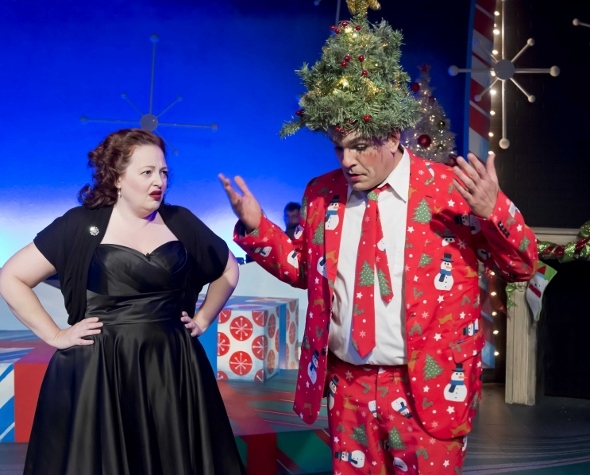 Produced by Catastrophic Theatre, A Very Tamarie Christmas is local goddess Tamarie Cooper’s 17th flirtation with musical as drug-induced memoir, a thing that begins with a thought, maybe with a question, and then romps joyously downhill from that point forward. In addition to “celebrating” Christmas in Houston summer (and running through August 30), the show ponders the eternal “What if.” What if, since nobody can agree on the “meaning of Christmas” – every year’s show has much about Tamarie’s being Jewish, along with her near-sexual obsession with pork products – what if we invested our devotion instead in a different American holiday. As if in a dream, or nightmare, all sorts of other holidays appear before Tamarie, and of course before us, making their case in funny dialogue, not to mention spirited song and dance. The script is original, the music is original, the lyrics are original, the set and costumes are original, so it probably follows that some bits and pieces of A Very Tamarie Christmas seem more finished or satisfying than others. But taken together, they are remarkably successful entertainment. Tamarie’s life is different now – she has a husband and a little girl – so there aren’t the same old rants about how she’ll never find a guy. In their place, though, are wise and knowing vignettes of American culture she perhaps understands better now that she’s living them. Her re-creation of the innocent, costume-and-candy of Halloweens past gets pasted over with parents who fear every neighbor is a “potential child murderer.” The innocence of this show resides in Tamarie herself, in her memories of what all such holidays used to mean and how those memories collide with what We the People have let them become. As in all the Tamarie musicals I’ve seen, in addition to the heroine of our story, Kyle Sturdivant lives on the edge of stealing every scene he’s in. He embodies the devilish wink of several alternative lifestyles with a childlike vulnerability. He works wonders as a tree on behalf of Arbor Day, but he downright channels Tim Curry as an overly plump Thanksgiving turkey who truly deserves the name Butterball. Thanksgiving is my favorite scene in the entire show, both for the turkey and for the wild, disgusting and oh-too-familiar assortment of Tamarie’s relatives who turn up to eat and complain. I love it that, by the end of Thanksgiving, the hostess herself is seen chugging from a bottle of wine. Other delightfully familiar faces include Greg Dean at Christmas itself, who kind of goes Grinch for a while, and Noel Bowers as a series of angry, foul-mouthed, cigarette-smoking holidays, most memorably the Cupid of Valentine’s Day who, as we all know by the time we’re 12, can’t shoot arrows worth a damn. There are dozens of unforgettably funny moments in A Very Tamarie Christmas – watching Tamarie “do” Jimmy Stewart in “It’s a Wonderful Life” as Christopher Columbus is a comic stroke worthy of Robin Williams. We leave the theater feeling strangely unburdened, if slightly breathless from so much laughing, having watched our own hopes and fears about the holidays manhandled in a way that makes it all better – manhandled by one very talented woman.